As my moglie Gioia and I were leisurely visiting the most beautiful southern Italy, we happened upon a small town on the west coast of Basilicata, Maratea. Soaking up as much of this wonderful town as possible, we explored the upper steps deep into the alleyways. We traversed upward, following a signora carrying two large leather bags, her daily needs from the piazza. Counting the steps 100, 156, 218… at 273 I lost count. Yet she continued up and up. 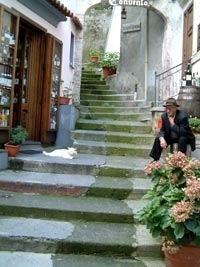 At a juncture of alleys the signora stepped into her home, wishing us buona giornata with a smile. We went our way, up again. Getting hungry we turned downward into another alley, but soon found ourselves back at the same corner where our bella signora lived. 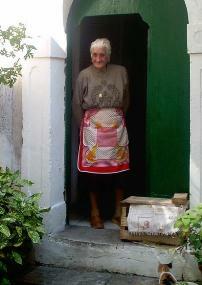 She was at her doorway so I asked, "Posso fare una foto la signora?" (May I take your picture?) She agreed but held her hand out telling me to wait. She reached inside for a broom, swept her front step, placed the broom back inside, straightened her apron and motioned go ahead. This was a remarkable memory of a remarkable lady who by the way, happens to be in her nineties.